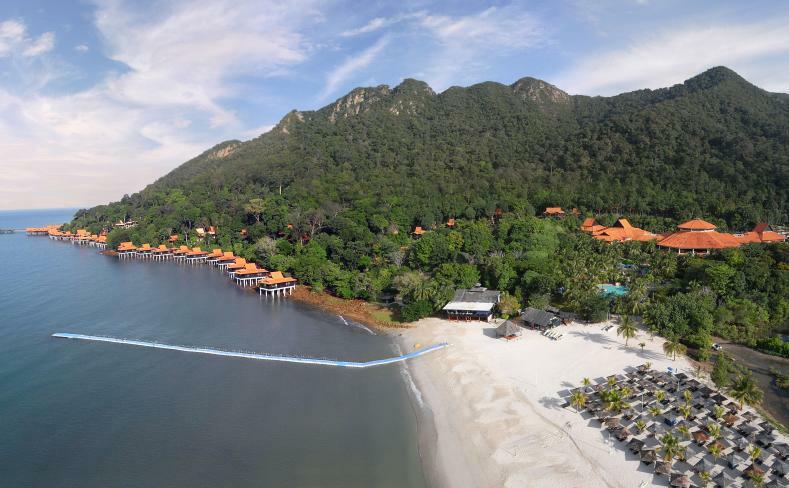 The Berjaya Langkawi Resort 85 acres of lush nature situated in Burau Bay, Langkawi. With accommodations that place you within the rainforest sanctuary, you'll be falling asleep to the sounds of nature and waking up with the view of the Andaman sea. If you're lucky you'll catch sight of various birds including sparrows, magpies, herons, the beautiful hornbills and soaring eagles. You might even meet some friendly white-faced monkeys that are native to the island. The expanse of this hotel is framed by the majestic Mount Machinchang, lush greenery and the ocean. If you venture out, the small town of Cenang Beach is about a 20 minute cab ride. Here you can see the little island shops mixed in with food joints and bustling nightlife. If you'd like to stay clear of that and be close to nature instead, the famous Langkawi Cable Car is about a 10 minute walk from the hotel. You can ride up to the top of the mountain in one of these glass bottomed cars and then walk the sky bridge from there. Even though breakfast and dinner are taken care of as part of the retreat, the hotel boasts five restaurants and three bars for you to choose from to relax and unwind including a Thai restaurant, a Chinese restaurant and bars located in the pool and the boat shack. Wander around the grounds of the hotel or take part in the many watersport or ground activities in the hotel. Go for a swim or laze around in the sun with a good book. You can also book a massage in at Taaras Spa, located in the hotel itself. You'll have a choice of staying in the resort itself, or to venture out to the attractions around the island. Transport can easily be arranged from the hotel and you can get a taxi back from the attractions you visited.